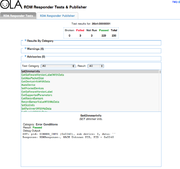 The RDM Responder tests can be run from the command line or using the Web Interface. Warning: The tests send SET messages to the broadcast UIDs. This means that they will change the start address, device label etc. of all devices connected to the controller. Think twice about running this on your production lighting rig. Verbose output can be enabled with the -d option. A subset of the tests can be run with the -t option. The following command line will run the SetDeviceLabel and SetStartAddress tests with verbose output. Be sure to read the Guide to interpreting the test output for an explanation of the output. rdm_responder_test.py has some options which can assist in debugging failures. For a full list of options run with --help. Show all debugging output, including actual & expected responses. Only run a subset of the Tests. Only the tests listed (and their dependencies) will be run. Some responders take time to write state changes to memory. When using broadcast SETs, the controller doesn’t know how long to wait before sending the next message. This setting adds a delay after (in ms) to wait after sending broadcast set commands. To use the web interface the rdm_test_server.py program must be running. Open a browser and navigate to the host running the test server on port 9099. This will usually be your local machine (http://localhost:9099) or the Raspberry Pi (http://<ip>:9099, replace <ip> with the IP address of the Pi). You will be presented with a screen like the one below. 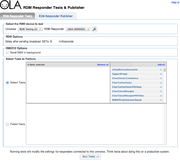 Select the universe to test from the drop down menu, followed by the RDM responder to test. If required you can run a RDM discovery on the universe by clicking the button with the magnifying glass. After sending a broadcast SET, the controller can immediately follow with another RDM command since no response is expected. This causes problems for some devices when they need to write to persistent memory as part of handling the SET command. This option adds a delay between a broadcast SET and the next RDM command. Typical values are 20 – 100ms. This option enables interleaving RDM frames with DMX frames. You can set the frame rate and the number of slots (channels) to send. Only some of the supported USB devices support simultaneous DMX & RDM. This allows you to select the tests to run. You can either add tests individually or select Add all. After running the one round of tests the list of failed tests will appear in the second box. After clicking the Run Tests you’ll be presented with the test results page. Read the Guide to interpreting the test output for an explanation of the logs. The Results by Category, Warnings and Advisories sections can be expanded to display further information. The logs can be saved for offline analysis by selecting the Download Results button on the results page. You can apply category and result filters to the test logs before saving them.